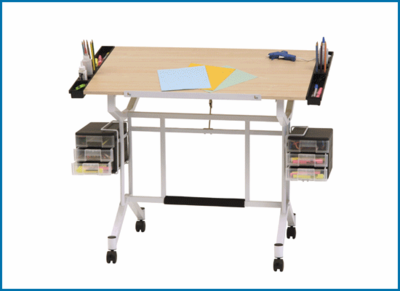 Architects, graphic designers, cartoonists, and painters can make use of the Studio Designs Pro Craft Station. The Studio Designs Pro Craft Station has received rave reviews. It establishes a more organized workspace to help free the minds of creative people. As a result, they feel greater inspiration and accomplish much more than they ever imagined. The Studio Designs Pro Craft Station is designed for for beginning and intermediate artists who aspire to pursue creative fields. This workspace is perfect for anyone committed to the craft, because it keeps all necessary supplies within arm’s reach. Helps make project planning much easier, and increases inspiration. This table is wonderful and was easy to assemble! My daughter is a budding artist, and she picked out this table. She's thrilled with it!!! Perfect for my needs. Comfortable to work at and is very mobile for me to move around the room. Not to big but also has adequate work space. Easy to put together too, took me about an hour. This desk is great. It did come with a slight hiccup where they sent the wrong part for the drawers, but the service was excellent. Just make sure you keep the case number they email you for fast service. It goes together tight and all the peaces fit just right. It does require though two hands on it all the time if your putting down a lot of pressure, but even then the movement isn't that bad. It rolls around on carpet really easily, and its top is very easy to adjust. I would definably recommend this to a intermediate artist or hobbyist.